A robust, warm season grass, St.Augustine grass (Stenotaphrum secundatum) forms a thick, dark green carpet that can stand up to wear. It’s a coarse grass with broad blades that establishes itself quickly. 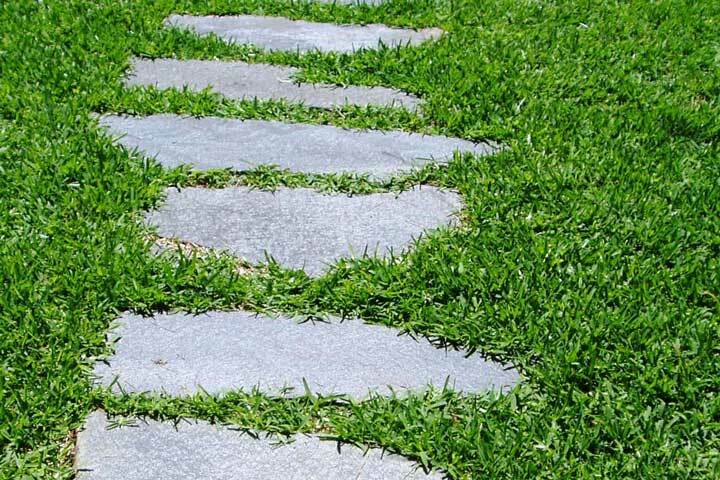 The coarse texture of the grass makes it a compromise choice, but St.Augustine grass has some powerful advantages in the yard. Because it’s robust and grows fast, St.Augustine grass naturally discourages weed growth. It will flourish in shady spots better than almost any other warm season grass and survive hot temperatures, too. It’s also salt-tolerant. St.Augustine grass isn’t an ideal choice, though. 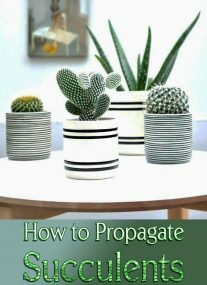 It requires regular watering to retain its vivid, deep green color, and it’s a heavy feeder, which means it will need to be fertilized frequently and mowed at least weekly during the summer months. It also tends to build up thatch that will have to be thinned out periodically. Older varieties of St. Augustine grass have been plagued with disease problems, including St.Augustine grass decline (SAD), but newer cultivars are much more disease-resistant than older strains. HIGHLIGHTS: Compared to finer textured grasses like the bermudas, St.Augustine has large flat stems and broad coarse leaves. It has an attractive blue-green color and forms a deep, fairly dense turf. It spreads by long above-ground runners or stolons. While it is aggressive, it is easily controlled around borders. It produces only a few viable seeds and is therefore commonly planted by sod, sprigs, or plugs. St.Augustine grass is a big thatch producer, more so than other types of grass. It also requires plenty of moisture and is best suited to humid regions. Has good shade tolerance, except for Floratam. Susceptible to fungal diseases. St.Augustine grass Decline is a virus common to Texas and Louisiana and there is no known control. Shade Tolerance: tolerates moderate levels of shade, but will become thin under dense shade conditions. WARNING: an ingredient in many weed/feed products (2,4-D) that were designed for cool-season grasses, Bermuda and Bahiagrass, can kill St.Augustine. If you intend to use a weed/feed product, make sure it is labeled for St.Augustine grass use. 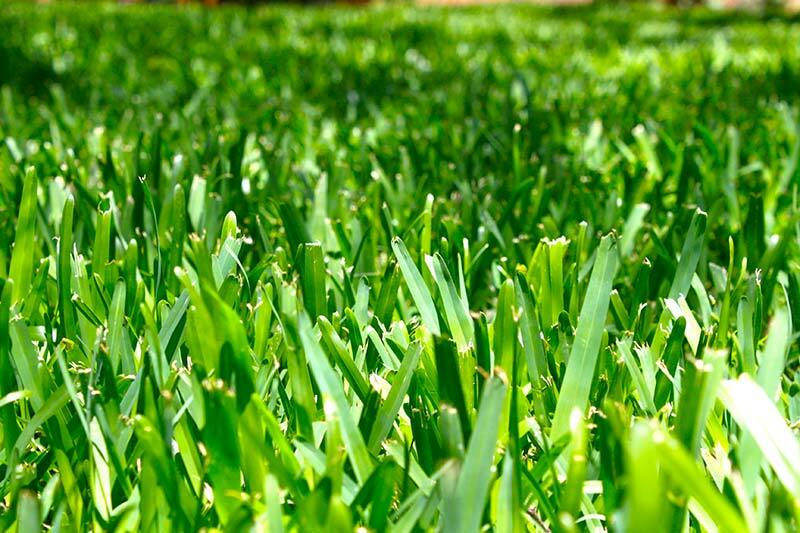 According to university studies, it is best to wait at least one month before fertilizing newly placed St.Augustine grass sod. During that first month, there is little root development or activity. This means that the turfgrass is not actively absorbing the nutrients and it is more likely that these nutrients will migrate away from the roots and there is greater risk these elements may enter the watershed. Bitter-Blue: a good option for shady lawns. Its slow growth rate means you mow less often. Has an improved cold weather tolerance. Delmar: a dwarf St.Augustine cultivar that has good shade tolerance, yet also does well in full sun. A delmar lawn has a tendency to develop heavy thatch. Delta Shade: has good shade tolerance, but not as good as dwarf varieties. Floratam: A popular among Florida homeowners, Floratam is adaptable to many soil conditions and thrives in direct sunlight. Palmetto: Good in coastal and island areas and is rapidly being positioned as a standard St.Augustine, having proved itself repeatedly since 1994. Prefers heat but will handle cold better than other types of St.Augustine. Performs well in both full sun and partial shade; has a natural resistance to cinch bugs. Raleigh: somewhat more cold-hardy, but does not hold up to summer heat as well as other St.Augustine’s. Has been adapted to grow in heavier, clay-like soils. Sapphire: The only high performance, finer blade St.Augustine. Has a distinctive deep, blue-green color along with a soft texture. Suitable for demanding, warm climates, Sapphire tolerates salt, shade and drought, making it an excellent choice for coastal regions. Requires less fertilization and displays improved recovery from wear, with reduced weed problems. Seville: Blue-green in color with excellent color retention, Seville tolerates salt, shade and drought well. Its long leaf blade gives it a unique appearance preferred by many homeowners. Floratam St.Augustine grass was released by the Florida and Texas Agricultural Experiment Stations in 1972 as a SAD virus and chinch bug resistant selection. It has since been observed to be brown patch tolerant. 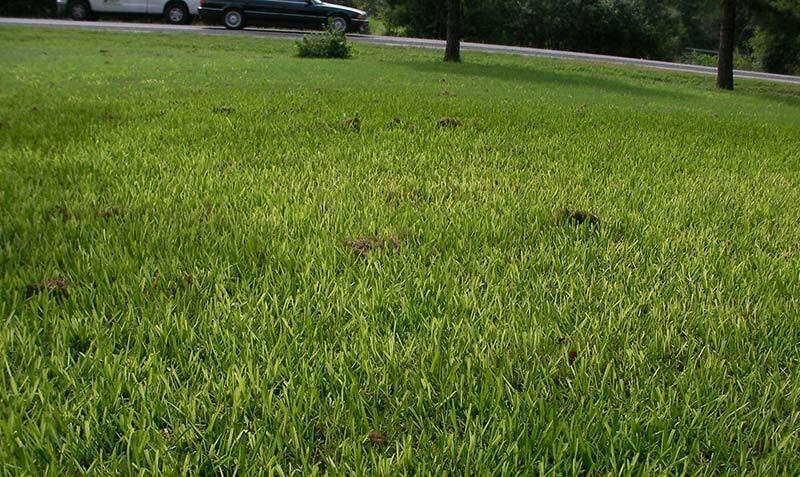 Like other Florida types, Floratam is a vigorous, coarse textured St.Augustine grass variety. Stolons of Floratam are large, purplish-red in color (demand this characteristic when purchasing sod) with internodes averaging 3 inches in length. 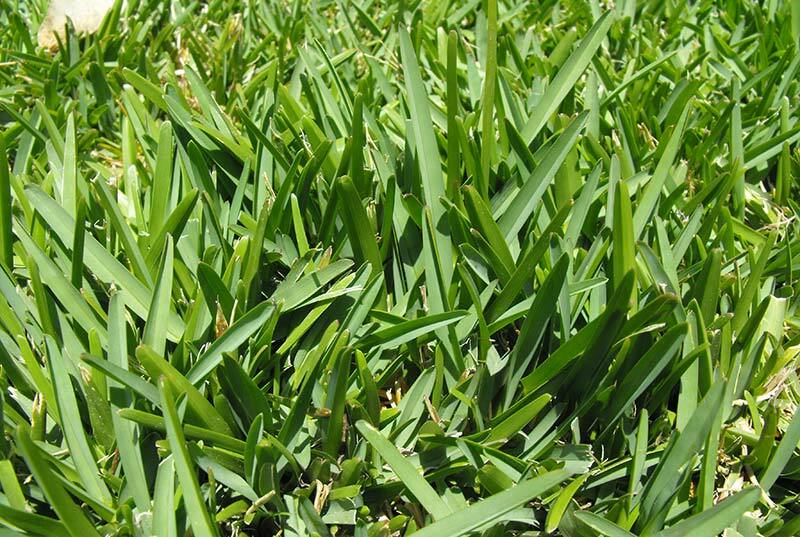 Leaf blades are wider and longer than common St.Augustine grass. According to James Beard, TAEX Turf Researcher, tests at A&M concluded it is the most drought-tolerant of all St.Augustine grasses. Floratam is not as cold tolerant as common St.Augustine, so preconditioning by use of Winterizer fertilizer (3-1-2 or 4-1-2 ratio) in the fall (October) is CRITICAL. Floratam may suffer freeze damage. A study of the drought tolerance of grasses entitled: ” Comparative Intra species and Interspecies Drought Resistance of Six Major Warm-Season Turfgrass Species” by S. I. Sifers and J. B. Beard, Texas A&M University. Their findings were: Four years of field drought resistance studies have been completed on a modified sand root zone. In the fourth year of the study, 29 Bermuda grass, 2 seashore pespalum, 2 Buffalo grass, 8 St.Augustine grass, 6 Centipede grass, and 11 Zoysia grass cultivars were subjected to 158 days of progressive water stress with no supplemental irrigation applied and less than 7.5 cm of natural rainfall. Degree of leaf firing was used as an indicator of dehydration avoidance and post-drought shoot recovery was used as the indicator for drought resistance. Significant drought resistance differentials were found across the cultivars and among the species. Results were consistent with the first three years of this study among the Bermudagrass, seashore pespalum, St.Augustinegrass, and Buffalograss cultivars. Among the Centipedegrass cultivars only Oklawn fully recovered. Leaf firing of all Zoysiagrass cultivars was in excess of 50%. All recovered, except Meyer at 20% and Belair at 45% after 30 days. Excellent dehydration avoidance was seen in Floratam and Floralawn St.Augustine grass. There were large variations in drought resistance among the 5 St.Augustine grass cultivars. Floralawn and Floratam showed high green shoot recovery. They showed less than 50% leaf firing after 34 days of drought stress and recoveries of over 90%. However, Texas Common and Raleigh St.Augustine grass as well as Prairie Buffalo grass showed over 98% leaf firing and less than 20% recovery. The performance of Floratam and Floralawn was excellent throughout the study in terms of shoot color, turgidity, and uniformity. They were comparable to 609 Buffalo grass. 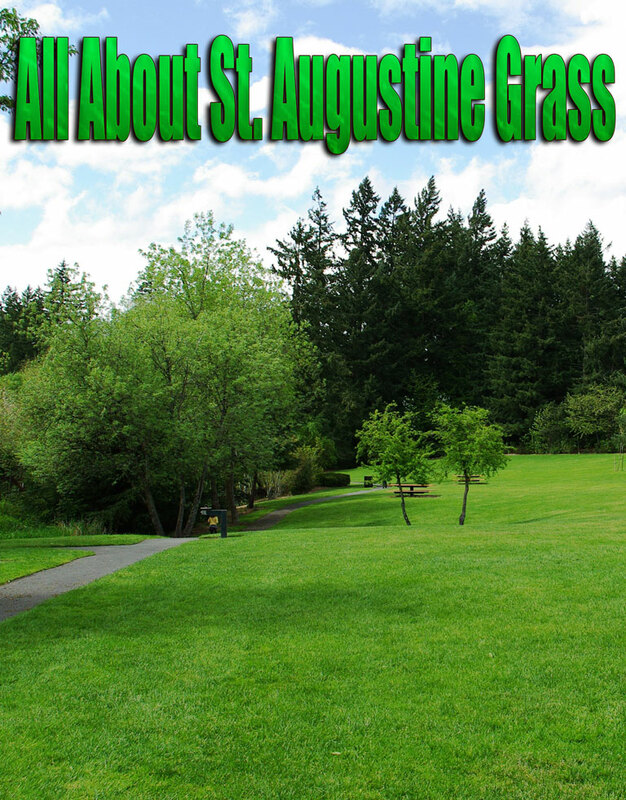 St.Augustine grass grows best in the warmth of spring and summer, when high temperatures are normally 80-100 °F. Plant St.Augustine grass plugs or sod in full sun, at least 90 days before your region’s first estimated fall frost, to give the grass plenty of time to establish. Determine the exact dimensions of the area you’ll be planting, to ensure you purchase enough St.Augustine grass plugs. A tray of 18 plugs will cover approximately 32 square feet. If you’re replacing an existing lawn, rent a sod-cutter to remove the old sod and vegetation. Next, apply a non-selective herbicide 2 weeks before planting to kill weeds; make sure you use a product that doesn’t leave a residual that would harm the newly planted St.Augustine grass. 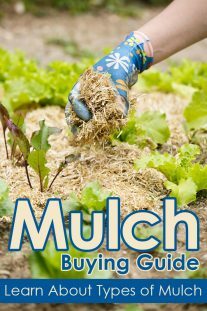 If you only have a few weeds here and there, you can hand-pull them, but be sure to get the entire root system. Otherwise, they will pop back up while your plugs are establishing themselves. Evenly apply Lawn Repair for St.Augustine Lawns over the planting area so that no bare ground in visible. Some lawn repair products contains fertilizer and a mulch that absorbs up to 6x its weight in water to help St.Augustine grass plugs fill in faster. Thoroughly water the area before planting. Watering makes the ground more malleable and gives the roots of the St.Augustine grass plugs immediate moisture. The water you apply should soak in, not remain on the soil surface. Continue watering until the lawn repair product is completely saturated and no more water is being absorbed which may take several minutes. Now the fun begins. Dig holes in a diagonal planting pattern, so each group of four holes forms a diamond. The holes themselves should be spaced 12 inches apart (so holes across the center of each diamond will be 15 inches apart). Each hole should be dug slightly larger than, but the same depth as, the plug’s root ball. You can also buy or rent a grass plugging tool from your local hardware store or online. This tool makes perfectly-plug-sized holes with a lot less work on your part. Press one plug firmly into each hole, making sure each is level with surrounding ground. If your holes end up being too deep, you can add a little nutrient-rich soil to fill in the extra space. Water daily or as needed until the plugs are firmly rooted and starting to spread. This will normally take about 7-14 days for the roots to establish. Afterward, water weekly unless your lawn is receiving generous rainfall. Newly planted St.Augustine grass lawns need protection while they are becoming established. The roots and turf are both susceptible to pests and diseases. Watch your lawn closely. If you see any brown spots or mildew beginning to form, contact your local extension agency for treatment options. 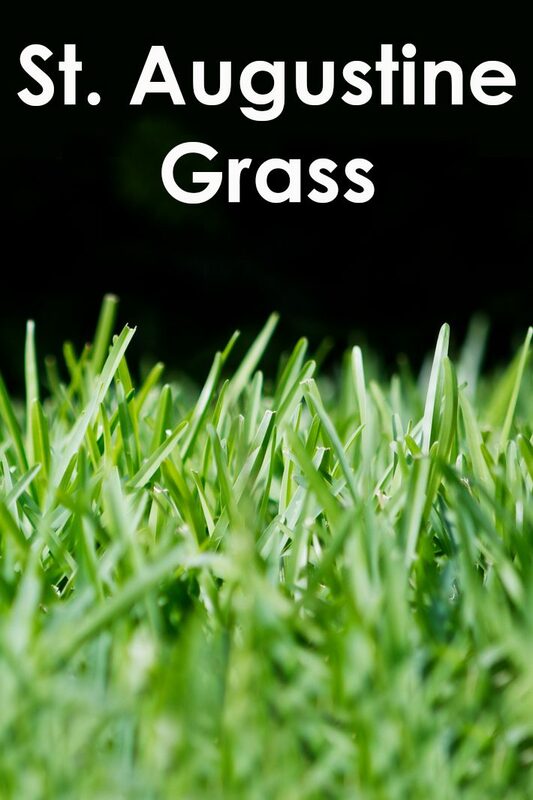 Once your new St.Augustine grass lawn starts to fill in and the grass blades reach a mowable height, cut the grass with the mower set to one of the highest settings (3-4 inches). Water your lawn when the leaf blades begin to fold and turn bluish-green in color. 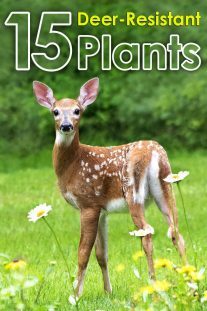 Six to 8 weeks after planting, feed with Lawn Food. Continue to feed every 6-8 weeks until the lawn has completely filled in. I adore it when folks come together and share views, great blog, keep it up.